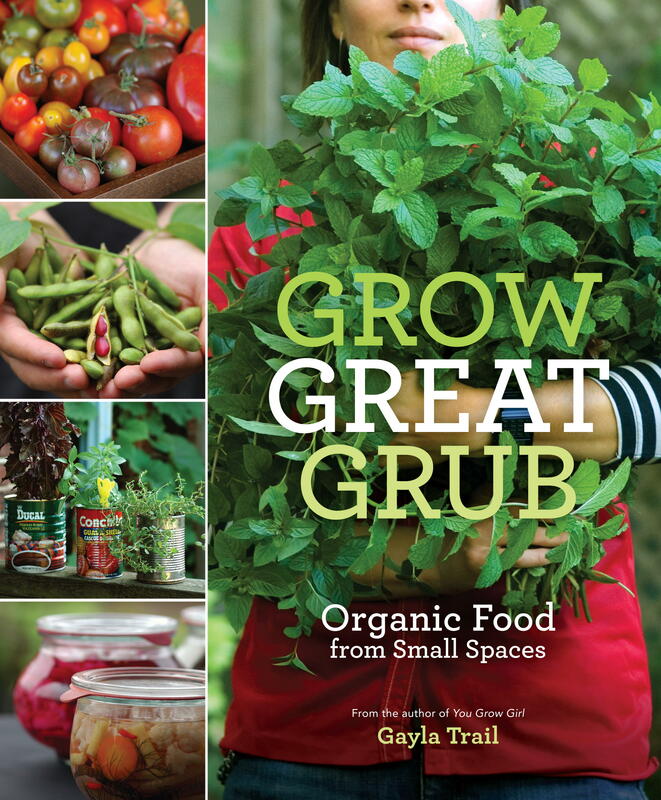 I just checked out a couple of gardening books from my local library. I will provide a in depth review of them in a week time. First-glance review: I love the pictures. I was salivating looking at the pictures. They look as if I could just grab them! The advice is easy to read and more aimed at a gardener just starting out…like me. 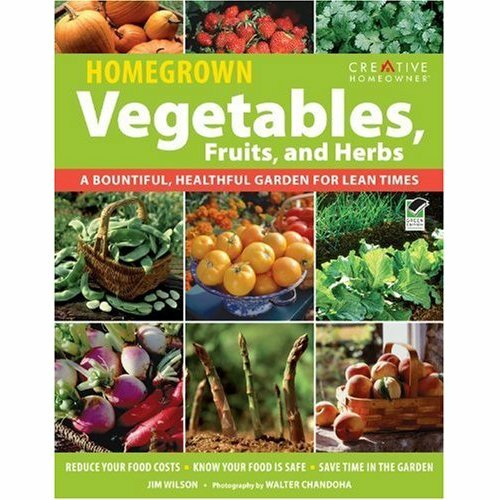 First-glance review: When I looked through it, Mel, the author is very knowledgeable in many different styles of gardening. He also provides how-to’s to better improve your garden. I really like the graphs especially the seed-starting graphs. First-glance review: Gayla Trail, author of You Grow Girl has done it again. She has great projects and tips in this new book. 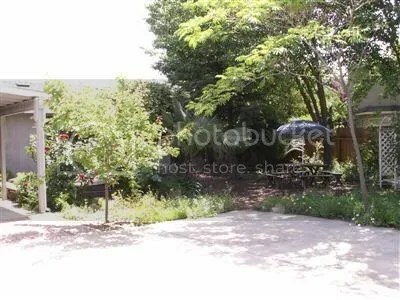 It is for the every day gardening: beginning, intermediate and advance. Happy gardening and stay tune for a full review! Here are some pictures of how the fall garden started out. Enjoy! Update of the Fall garden. I was able to have success on all the seeds I planted in my raised beds and I planted a lot of things. The list includes: beans, carrots, lettuce, peas, garlic, cilantro, basil, radishes, arugula, spinach, cucumbers. It was a busy fall and winter. The beans were the success of the story. It was so nice to have so many different colored beans in your dinner. We grew purple podded beans, green beans, and yellow wax beans. I allowed a couple of plants to grow and dry so I would have some for next year. I absolutely love the purple podded beans. 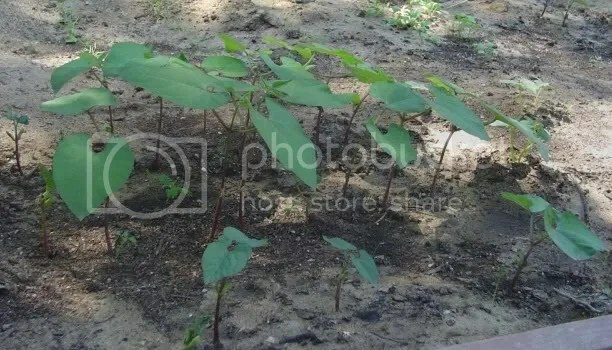 They are actually a bush variety that produces purple beans. However, when you cook them, they turn green. I believe the purpose of the purple shell is so it is easier to find. Imagine picking green beans in a sea of green leaves! Almost everything survived the winter except for the beans, arugula, cucumbers, and basil. Those are typically warm season plants so I did not expect much from them. I was able to enjoy a plethora of arugula before they died. 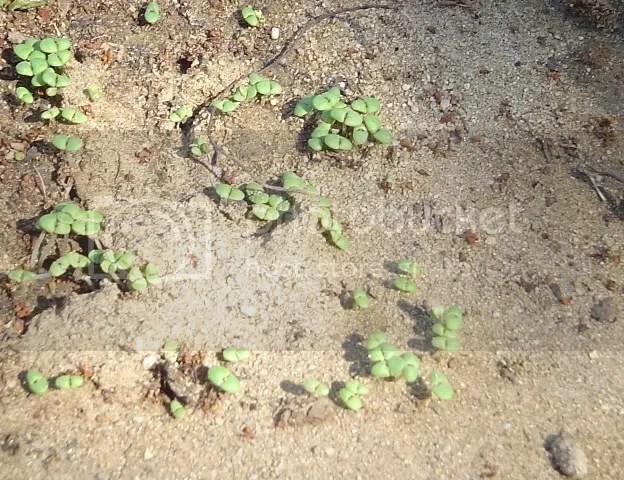 I had planted arugula in my front yard and I allowed them to seed and I find arugula everywhere now. So beware, arugula can be a weed to some gardeners J. I enjoy them nonetheless. I’ve slowly started putting my tomato, peppers, and eggplant seedlings outside in the backyard. They are getting acclimated to the weather. I still do not have a dedicated garden space yet so I’ve been placing them onto of this old picnic table we have in the back yard. The dogs, however, have figured out how to get on the table and pull out lettuce seedlings. Urgh…those dogs but they are just so cute when I see them with a fistful of lettuce in their mouth frolicking about. And then you’ll see me chasing them screaming “No!” As the old saying goes, “you win some and you lose some”. It just seems I’ve lost quite a bit to the little rascals! I hope they don’t get to the tomatoes and peppers though. Those took a long time to germinate and it would be such a shame to lose them now. I set those on top of a planter on the table so unless they knock the planter down, they’ll be fine. The other day I planted more herb seeds. We use a lot of herbs in our cooking so growing herbs is important to me. I planted more lemon balm, chives, basil (large leaf, and Genovese), thyme, and oregano. I have them in 3 inch pots and they’re sitting on a sunny windowsill. 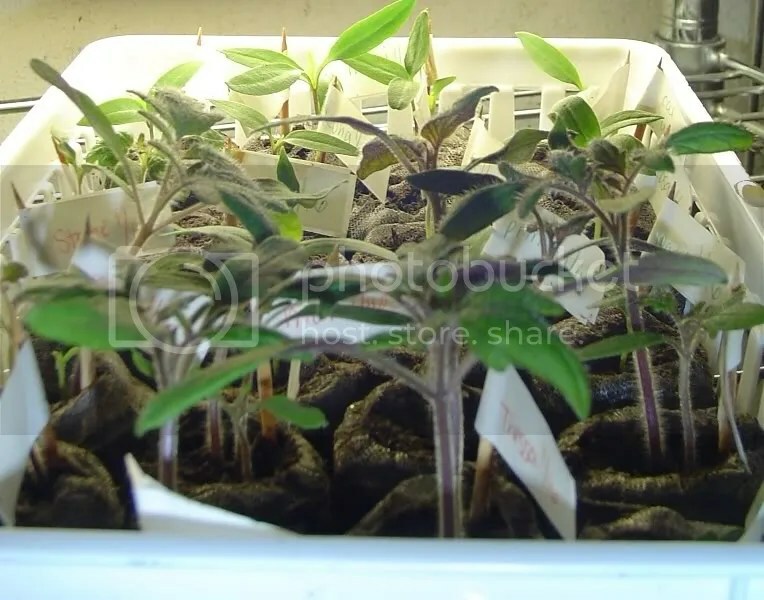 They’ll germinate in a week or so and I’ll slowly take them outside with the other seedlings. Other things that are sprouting under my grow lights are marigold-snowball, zinnia-envy, impatiens, coleus, and more! I also planted some more pepper and tomato seeds. I forgot some names but I labeled the container so I can go back and check. The ones I do remember are supersweet, red currant, and Mexican honey. I’ll have to take some pictures tonight. In the past 3 years I have been vegetable gardening, I would plant all my seeds in seed trays with 72 divisions. 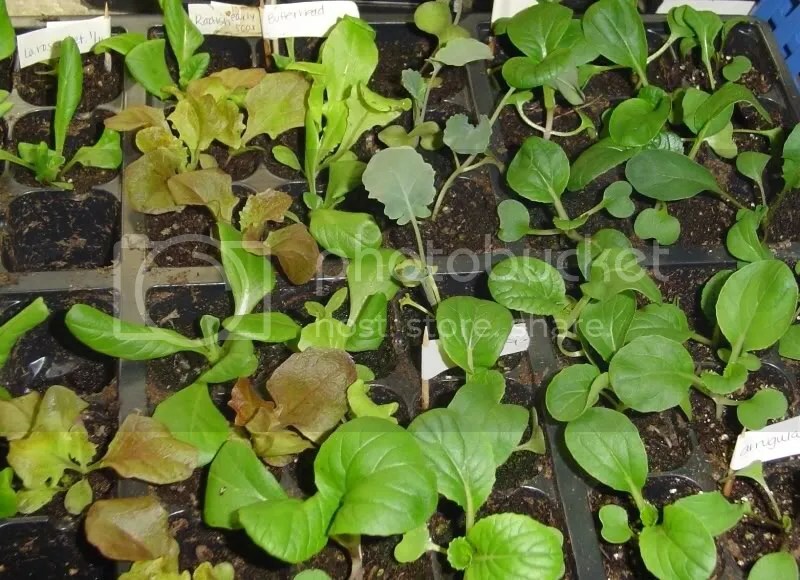 And since I am not the greenest of gardeners, I normally did not get 100% germination on all my seeds so my seed trays always had bare spots sprinkled amongst the divisions. This always bothered me because I was a perfectionist and the fact that I could have had other seeds that would have germinated in those spots. 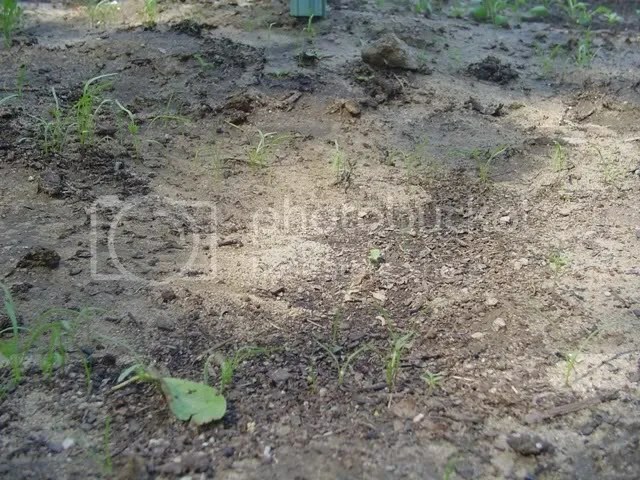 I am sure other gardeners have also felt this frustration. So I promised myself that I would not do this the next year. However, my forgetfulness got to me and I continued with my habit of taking out my large seed trays and planting my seeds in them. Then I remembered my promise to myself the previous year. So, I pulled out some old trays I had laying around (a cheap way to get your hands on these is to save the trays you get from the frozen dinner meals. They’re perfect size to start seeds). I planted a lot of veggie seeds in these and once they developed their true leaves, I pricked them out and set them in my seed trays with divisions. That way I got a full tray of seedlings and no empty spots! I thought I would share my “aha” moment with yal. Yesterday, I took some endive seedlings I had planted in a pot and moved them into their individual spot in a six-pack I had. 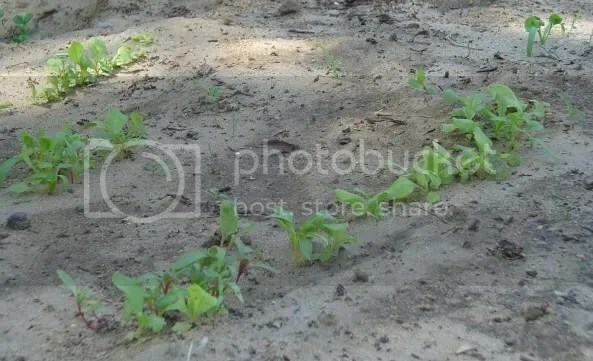 Afterwards, I marvelled at how pretty and neat it looked with seedlings in every spot! I was very proud of myself. I also moved some bibb and buttercrunch lettuces into their own spot. My tomato, pepper, and eggplant seedlings are doing well. Although they have been slow to germinate, I’ve been getting several pop up on me daily. To aide in germination, I decided to take the trays with me to work in my car. My car gets a lot of sun throughout the day and I thought it would be a perfect spot for my seeds to get some heat. So in the car they went yesterday along with my seed potatoes I have been chitting. The potatoes already have little eyes on each one of them. They should be ready to pot up in the next couple of weeks. Since we haven’t gotten around to making raised beds, I have decided that I am going to plant almost everything in containers. I plan on planting the potato seeds I have in pots and moving them to their final place when we get everything set up. I hope this is okay for potatoes to do this. If not, I’ll know for next year. Early spring veggies in 2008. On Saturday, I planted more flower and veggie seeds. The other day when it was sunny, I decided to take my seed trays out for some fun in the sun. Unfortunately, when I brought them in, the tray snapped and some of the 9 packs fell out spilling dirt and I would assume some seeds. So, just to be safe, I decided to plant some more seeds. Instead of using 6 or 9 packs I decided to plant them in trays in little rows. I planted some more butterhead lettuce (Renee’s garden), black seeded simpson lettuce, romaine lettuce (trade), arrugula, coleus, cabbage, broccoli, bok choi, impatiens, violas, bells of irelands, and snap dragons! Whew….that was a lot. I also got some elephant garlic on Monday from the grocery store. The garlic is from Christopher Ranch. I planted it that day and I hope to get some sprouting soon. 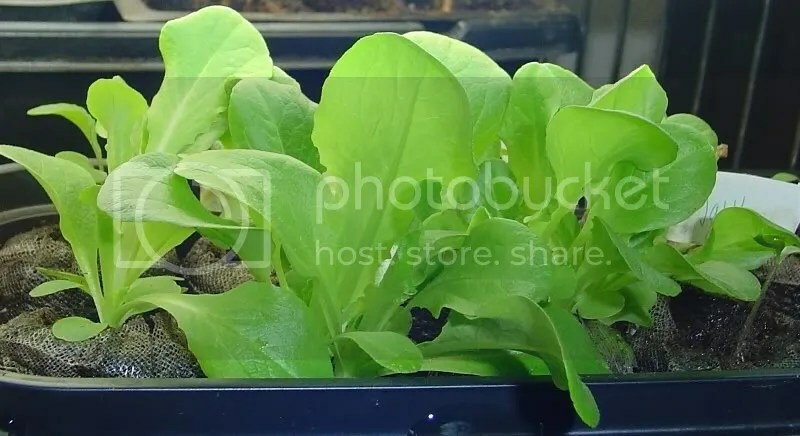 The lettuce, bok choi, savoy cabbage, butterhead lettuce, and la rossa lettuce sprouted and are under the grow light. There are more seeds that sprouted but I somehow forgot to label them. It’ll be easy to figure out once they’ve fully sprouted and I can check them out visually. Still no progress on the eggplants, peppers, and tomatoes. I set them directly on top of the lights to get some heat to them but we’ll see in the next couple of days. I’m really excited to see if the “little prince” eggplants I got from Renee’s seeds turn out! I’ve been debating whether or not to purchase a heat mat for my seeds but it seems like setting them on top of my fluorescent lights is fine. I have two lights on the bottom of my rack and I balance trays on top of the 2 and set my containers on top and they seem to be fine. Any tips would be greatly appreciated. That’s all for now, happy gardening! I’m so excited to start seed starting this year. This year, we finally have our very own house and yard to garden in. I can not wait until we have the backyard finished so we can put in my veggie garden. I hope to have my plot done by next year so this year will mainly consist of gardening in the front yard and in various size pots. Who says you can’t plant vegetables in the front yard? I plan on it! I have a couple of patches of dirt that are currently bare. 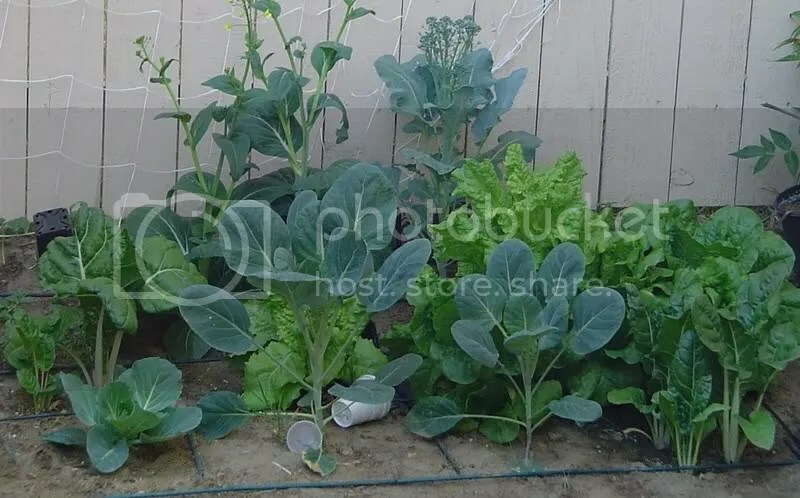 Since the front of our house faces north and doesn’t get too much sun, I want to try some cool weather veggies like lettuce, radish, broccoli, cabbage, arrugula, bok choi, brussel sprouts, onions, and more. I have also started planting garlic cloves in pots too. I started planting seeds this Wednesday and to my surprise I already have some germination on my savoy cabbages and bibb lettuces! The weather in California is amazing. There is early morning fog and that burns off by 9:00 am and we get sun throughout the day. It warms up to around 60 degrees and cools to 35 degrees at night. However, the weather forecaster predicts some rain next week but for now we’re enjoying the weather!